Discourses on Satipatthana Sutta, a condensed version of S.N. Goenka's discourses from an eight-day course on the Mahasatipatthana Sutta. Goenkaji reads and interprets the sutta in his discourses, giving life and inspiring relevance to the primary text given by the Buddha about Vipassana meditation practice. 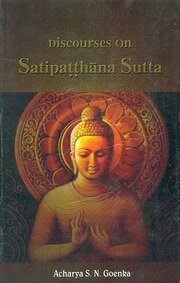 Mahasatipatthana Sutta - This annotated translation of the Mahasatipatthana Sutta, the primary discourse in which the Buddha describes the practice of meditation in detail, is intended for use in the meditation courses on the Satipatthana-sutta as taught by S.N. Goenka. It will be of interest to any serious student of meditation or of the Buddha's teaching. in my point of views there is one of most good book. i also want to get this book. in my point of views there is one of most good book. i also ..